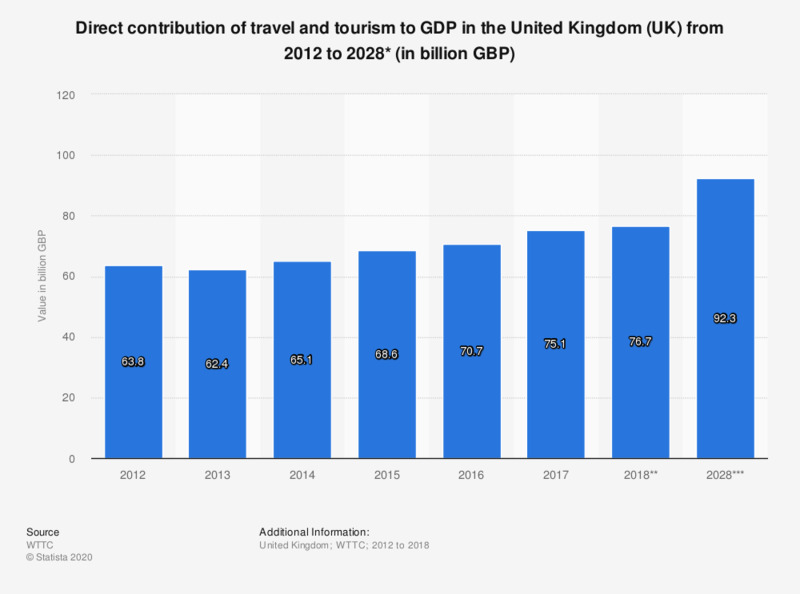 This statistic presents the direct contribution of travel and tourism to GDP in the United Kingdom from 2012 to 2018, with an additional forecast for 2028. Over this period, the direct contribution of the travel and tourism industry to GDP in the UK increased, reaching 75.1 billion British pounds in 2017. The source provides the following definition: "GDP generated by industries that deal directly with tourists, including hotels, travel agents, airlines and other passenger transport services, as well as the activities of restaurant and leisure industries that deal directly with tourists. It is equivalent to total internal Travel & Tourism spending within a country less the purchases made by those industries (including imports). In terms of the UN’s Tourism Satellite Account methodology it is consistent with total GDP calculated in table 6 of the TSA: RMF 2008.."